Are efforts to keep Malé City clean going to waste? Sunday (November 16) will mark 100 days since Minivan News journalist Ahmed Rilwan disappeared. As friends and family continue to hope for his safe return, some of Rilwan’s best work will be re-published as a reminder of his talents and dedication to his profession. This article was originally published on May 20, 2014. Since publication, the Tatva renewable waste management deal has been terminated by the government. Malé City Mayor Mohamed Shihab – elected during the recent council elections – has quickly learned that keeping the streets of the Maldives’ capital clean will be be no easy task. Dealing with the waste management issue of one of the world’s most densely packed islands is no small feat, he explains, with local politics furthering cluttering the issue. However, keeping the streets free from litter is just the tip of the rubbish pile explains Shihab, revealing the difficulties the council continues to face in finding a sustainable way to manage the capital’s waste. “As we increase our efforts to clean Malé, the amount of garbage dumped on to the street is also increasing,” said Shihab. The purpose of cleaning Malé’s streets and providing public dustbins – for which 260 people are now employed – is not to collect household waste, but to clean up litter, the Mayor tells Minivan News. It is important to cultivate a habit of keeping the streets clean and using trash bins in the community, he said, suggesting that the implementation of laws was also required to address the issue. The waste management regulation which came into partial force on February 5 imposes an MVR100 (US$6.5) fine for littering and a fine between MVR10,000 (US$ 648.5) and MVR100,000 (US$6,485) if any authority in charge of public spaces fails to provide dustbins. 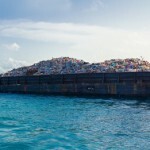 The regulations also require boat owners to place dustbins on sea vessels, imposing a maximum fine of MVR100 million (US$6.5 million) on boats that dump waste into the ocean. Speaking to Minivan News, Ahmed Murthaza – assistant director at the Environmental Protection Agency (EPA) – said that no one had yet been fined under the regulation. The main focus of the EPA up to now has been to create awareness and to advise offenders to correct their actions, although he warned that the agency would start imposing the fines beginning on World Environment Day (5 June 2014). The EPA will be working with councils and the Environmental Police Unit in implementing the regulation – all of whom are authorised to issues fines. Mayor Shihab has suggested a long term solution for the issue would be the door to door collection of household waste. Most households in Malé currently employ garbage collectors – usually migrant workers – who carry the garbage on their bicycles or private pick-up trucks. 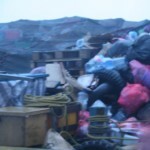 This garbage is then carried dumped on a barge in the island’s south-west harbor, which then transports it to the landfill ‘garbage island’ of Thilafushi. This arrangement, however, was intended to be a temporary one initiated in 2013 after garbage piled up in Malé’s two primary waste yards following damage to the collection vehicles. 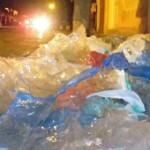 According to the council, the current arrangement will remain in place during the Islamic month of Ramadan – beginning on June 30 – when the household waste produced can be expected to double. According to shipping industry sources, an estimated 15- 20 percent increase in imported goods is expected during Ramadan. Environment Ministry data from 2007 put daily food waste produced in Malé at approximately 25 tonnes, while 2012 statistics indicated that 89,797 tonnes of domestic waste was dumped on Thilafushi annually. “Dumping waste on to the barge was a temporary measure, but this operation will continue in Ramadan with more barges. Instead of keeping a huge pile of waste in Malé, we will work to transport it as soon as possible,” explained councillor Shamau Shareef. For the council, the immediate hope for a solution to Malé waste management is in India-based Tatva Global Renewable Energy. The Tatva agreement has faced delays after the government of President Dr Mohamed Waheed renegotiated the agreement signed by his predecessor Mohamed Nasheed in 2011. The new agreement, which will not include collection of garbage from household in its first phase, now requires the final approval of the Finance Ministry to begin operations. Under the Tatva agreement, the council’s equipment – including trucks and excavators – has to be to handed over to Tatva in working condition. However, as the council’s equipment has been damaged for over a year, funds are needed for repairs before the handover. “Our concern is that the government is spending MVR7 million [monthly] to rent this equipment, such as excavators, landing craft, and the barge. This money belongs to the people,” said Shihab. Suggesting that the council could get the same results for just MVR2-3million, he said that the ministry had repeatedly ignored requests for repair funds. The existing arrangement must be replaced with permanent and sustainable solution, said the mayor, noting that the smell alone from the garbage barge was becoming unpleasant for people living in the vicinity.